MORPHE has a new foundation out called FLUIDITY. This foundation comes in 60 shades!!!!! That has to be a record for the amount of shades a foundation comes in. I purchased the new foundation to try it for myself and to see how well it matched my skin. I also was able to interview one of the models from the campaign, Demi Grace. Fluidity Full-Coverage Foundation comes in 6 different shade levels of color depth with 10 shades in each color depth. I am F1.10 Fairest with Neutral Undertones. Because it is really a struggle to find the right shade for you, MORPHE has come up with 60 shades in a long-wearing, full-coverage foundation that performs like a "boss" in is not caught in the middle or playing sides. Instead, this foundation values your hue (and your wallet). The shade game is officially over. Your face has finally found its match. Say hello to an all-in kind of foundation. All the soft matte coverage. All the time. 24-hour wear. Sweatproof, transfer-resistant, water-resistant. Free of oils, fragrance and parabens. Great for all skin types. What is the foundation like? It is VERY nice. I used just one large quarter sized amount for my whole face on the bottom end of a new beautyblender sponge. I found that it gave me full coverage, a matte finish, is indeed transfer-resistant, water-resistant and is sweatproof. I love that it is all of these things, especially sweatproof, which will come in handy for summer. It is like a dream and just blends into the skin like it is almost a second skin, without any trouble at all, unlike some other full coverage, long-wearing foundations (which can have trouble blending sometimes). Another thing is the amount of shade choices alone, which can be daunting to try and find a shade choice, but MORPHE makes it easy with their shade finder. For me, I always know I am just about the lightest one and I am neutral toned, so it was easy for me to find my shade. This is a foundation that I think will be well received and well liked among foundation freaks like myself and other beauty junkies. It doesn't have a sunscreen in it, which means that you will need to wear at least a SPF30 underneath it, the reason is that this is meant for makeup artists as well as beauty junkies alike. It is for everyday wear and editorial work. It is quite easy to wear a sunscreen underneath your foundation. Supergoop makes all different kinds and are my recommended choices. Demi is a Nigerian Born model, pop singer, songwriter and dancer who is currently promoting her single "Come Closer". She is a brand model for Pantene and was the first model with dreadlocks featured in a Pantene hair care commercial. She is also proud to have been cast in the MORPHE Fluidity campaign too. Just last week, BET Soul debuted her soulful and sultry new video for the single "Come Closer". Her 2018 singles have accumulated over 4 million streams and featured on Beats 1 Radio’s Discovered on Apple Music by Hot97’s Ebro Darden. Grace performed with Beyonce at the VMA's in 2016 and Solange at the Red Bull Music Festival in 2017. In 2016, Grace sang the theme song for Dark & Lovely's Fade Resist commercial that aired nationwide in the US. In 2014, Demi Grace was on the cover of Rolling Out Magazine and has worked with several beauty brands. Demi Grace has opened for Femi Kuti, Davido, Tiwa Savage, 2Face Idibia and has toured in the US, Nigeria and London. 1) What led you to become a model? 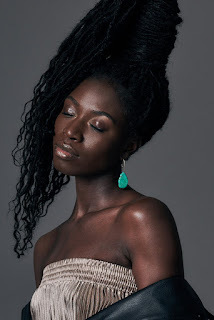 "For the majority of my childhood years, I was told that dark skin was not pretty. I saw that the fashion industry was embracing dark skin and this led to me wanting to model. I also started modeling because I knew that modeling would help me build my brand as an artist." 2) How long have you been modeling? "Professionally for about 10 years"
3) How did you happen to book the MORPHE campaign? I love that you are the one of the faces of the campaign, because it’s unusual to see women of such diverse skin tones be one of the main faces of a foundation campaign and I think it speaks volumes that MORPHE chose you. "Thank you! My agent sent me to a casting for the brand." 4) Do you think this will bring about change in the cosmetics industry to use more women of diverse ethnic backgrounds for their campaigns, especially in countries like the USA? 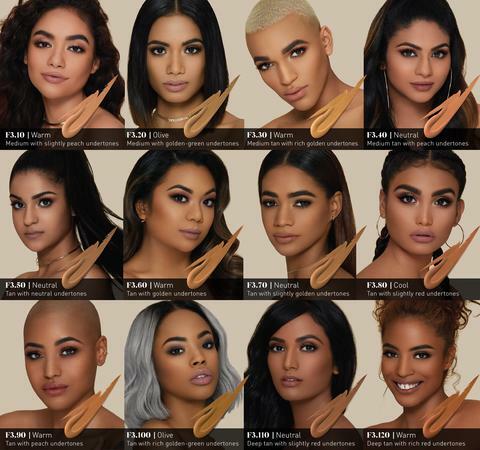 "The cosmetic industry is already changing, this campaign is doing the right thing by including diverse skin tones and ethnic backgrounds in their campaign." 5) What is the biggest obstacle you have had to overcome in your career? What helped you pushed past it and made you through it? "I have overcome A LOT of self-doubt. I’ve learned to just tune out the noise and tune into my higher self to produce the best outcome." 6) What would you like to say to young women who aspire to be like you (because you are a great role model to young women of today)? "Remember there is only one you in this world. You are the only one who is exactly like you and that is your power!" 7) What are the next projects that you have planned? Anymore albums? "I have a huge deal to be announced very soon! More music is always on the way! :)"
8) I see that you are also a dancer, as well as a singer. What do else would like to get involved with? Would you like to become an actress? Entrepreneur? "I have my degree in business management so it’s very safe to say expect entrepreneurship from me. Specifically in the beauty and fashion industry." I hope that means that she will have her own beauty brand soon! MORPHE Fluidity Full-Coverage Foundation is available online and in MORPHE stores at www.morphebrushes.com. Like MORPHE on Facebook: https://www.facebook.com/MorpheBrushesCosmetics/; Follow MORPHE on Twitter: @morphebrushes; Follow MORPHE on Pinterest: https://www.pinterest.com/morphebrushes/; Follow MORPHE on Instagram: https://instagram.com/morphebrushes and and Add MORPHE to Snapchat: https://snapchat.com/add/morphebrushes.